Shares of global transactions and remittances giant Euronet Worldwide (NASDAQ: EEFT) rose 10.9% in month of October, according to data from S&P Global Market Intelligence . EEFT data by YCharts . Early in the month, Visa Inc. (NYSE: V) opened the door for Euronet to process dynamic currency conversion (DCC) transactions globally on Visa-branded cards beginning in April 2019. DCC technology allows travelers in foreign countries the ability to conduct transactions in their home currencies — for a fee. Until now, Euronet has provided the service primarily in Europe through its ATM network. The expansion by Visa allows Euronet to offer the service in growing markets like India, in which it has substantially increased its ATM presence over the last several years. 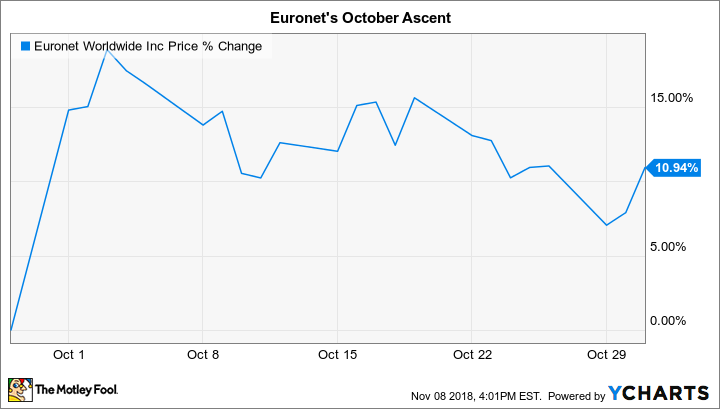 Euronet shares jumped on Oct. 1 when it issued a press release confirming the Visa rule change. The company already offers DCC services globally on Mastercard -branded cards. Management estimates that the Visa rule change will add $0.60 to $0.65 in diluted earnings per share (EPS) to its coffers in 2019. Later in the month, on Oct. 18, Euronet released its third-quarter 2018 earnings report, which featured double-digit revenue growth of 12% over the prior year, to $714.5 million. Euronet’s diluted EPS improved by 5% against the third quarter of 2017, to $1.89. The company has posted vibrant top-line growth throughout the year due to vigorous expansion of its ATM network. For example, Euronet’s electronic funds transfer (EFT) segment increased its global ATM count by 10% over the third quarter of 2017 to nearly 42,000 machines. Euronet also benefited during the quarter from growth in its money transfer segment, which powers the customer money remittance platform for Walmart , among other corporations. Euronet is expecting another strong quarter to close out 2018. Management anticipates netting adjusted EPS of $1.27 in the fourth quarter, for an improvement of 12% over the comparable prior-year period. I’ve written a more detailed third-quarter earnings recap for those interested in learning more about this transaction and remittances powerhouse. David and Tom just revealed what they believe are the 10 best stocks for investors to buy right now… and Euronet Worldwide wasn’t one of them! That’s right — they think these 10 stocks are even better buys. Asit Sharma has no position in any of the stocks mentioned. The Motley Fool owns shares of and recommends Mastercard. The Motley Fool owns shares of Visa. The Motley Fool recommends Euronet Worldwide. The Motley Fool has a disclosure policy .